The Headliner of a car may start Sagging due to any reason. Sometimes the Sagging headliner starts sagging if your car is too old, or if you park your car in the sun regularly. Yes, overheating and lack of maintenance can lead to deterioration of glue that holds the headliner to the ceiling of the car. The fabric or foam starts sagging usually at the edges and corners of the roof. It needs professional assistance to fix a headliner that starts sagging from various areas of the cart roof. However, if the problems are only minor like at the corners or edges, you can fix the headliner yourself using a few DIY tips and tricks. The headliner is also called roof liner, and you can fix the sagging areas using glue. Visit a motor spares shop and ask for the headliner glue. Don’t use ordinary glue as it cannot stick the fabric to the foam under it. Use only the special headliner glue to paste the fabric to the foam. Check if the spray adhesive is available as it can spread uniformly over the required surface. However, the gluing technique is useful only, if the fabric is sagging in the corners or edges. You cannot glue a headliner sagging from the center of your roof. Sequin pins are the easiest and inexpensive solution to a sagging roof liner. Also, it takes a few minutes of time to fix the headliner with sequin pins. Hold the sagging area of the fabric and insert the pins in it. Then push them gently into the fabric, so that they enter the foam under the fabric. The main benefit of sequin pins is that you can use the pins in any area of the headliner. Using clear-headed twisted pins is another inexpensive and easy solution to fix a sagging headliner. The clear-headed pins are the best as they don’t harm the foam beneath the roof liner fabric. The best thing about clear-headed twisted pins is that you can use it to fix all the areas of the headliner, even the entire material. Moreover, these pins don’t damage the fabric and save you from the expensive repairs that may be required in other DIY methods. The steam cleaner and paint roller serve a dual purpose for your roof liner. It cleans the fabric as well as reattaches it to the roof. A roof liner sags when the glue under the fabric becomes ineffective. Take a steam cleaner and fill it with water and switch it on to allow the water to get heated. Use the adapter of the device to spray the hot steam on the sagging areas. Then press the fabric gently with a paint roller to clear the creases and wrinkles. The paint roller presses the fabric so that the melt glue spreads uniformly and helps the fabric stick to the foam. This method is useful for a temporary fix until you use a permanent solution. Purchase a double-sided tape from any stationery shop and put it on the back side of the sagging fabric. Then press the fabric gently so that the tape sticks to the foam underneath. This method is suitable only if the material is sagging on the edges or corners. If you want to fix the sagging headliner temporarily, you can use the stapler pins to hold it on your car ceiling. However, you need to use a staple gun as the paper stapler will be of no use to fix the sagging roof lining. Use the staple gun to fix the fabric to the foam at the sagging areas. However, it is not a permanent solution, and you should consult a professional to fix the headliner. The DIY methods may work temporarily, but they are not a permanent solution. 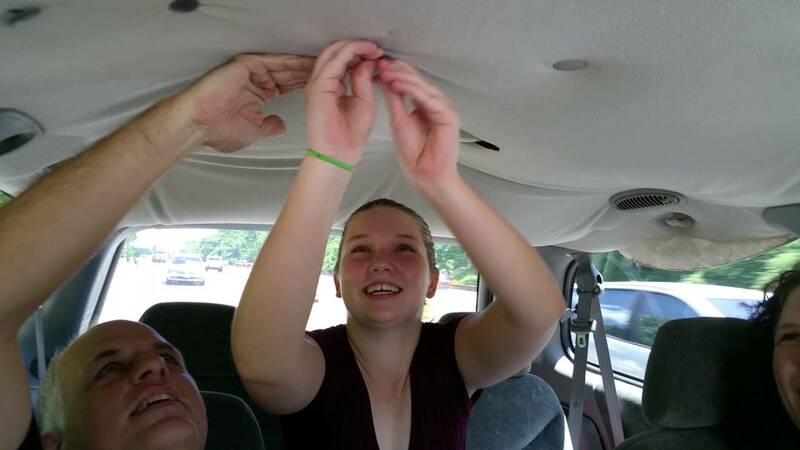 You need to consult a professional service for a permanent solution for your headliner. There are car roof lining repair services in every town and city. You can look for a reputed service in your area and consult them to repair your roof lining. You need to search a service online according to the area or city. For example, if you live in the Gold Coast, you can search for car roof lining repair Gold Coast to look for the relevant service in your area. These are the DIY tips and techniques to fix a sagging roof liner. However, it is best to get the sagging headliner fixed by a professional. They have all the tools and techniques to fix the sagging liner permanently, and you can drive your car without worrying about the fear of headliner falling in the car. Previous article20mm worktops Vs 30mm worktops – Which worktop thickness you should use?